I recently came across an old journal entry of mine from the spring of 2006. For the majority of the piece, I rambled on and on about what I can only describe as nonsense. But right towards the end I wrote these words “I don’t care about the poor.” For many people who know me now, these words seem preposterous almost anti-Ebony, but I know and remember very well where they come from. To make matters worse, perhaps, I entertained this idea that the poor were to be blamed for their own problems. Never mind the fact that I came from poverty myself. Back then I blamed my parents for the financial struggles we faced, thinking that if they had their act together things would have been better for us (years later I now know that is NOT the case). Not only so, I thought that if poor people would just believe in Jesus, He would make things better. Yes, my Pentecostal/ Evangelical upbringing reinforced this line of reasoning in me to the point that this was the lens that I saw EVERYTHING out of. In my mind, refusing to embrace Christ was a one way ticket to hell on earth in the present as well as in eternity. Jesus, to me, was the magic fix-it upper, genie in a bottle who made all of the problems in one’s life disappear like a good magician should. Since I blamed the poor for what they experienced, I felt like I was let off the hook. Sure, I would donate to some good-willed mission every now and again, and I sponsored children in far off places with swollen bellies who were living on less than a dollar a day. That felt right. That felt safe. But I never did anything to meaningfully engage nor did I allow myself to really sit and ponder the systems that were at play that caused their hunger and poverty. That is, not until I went to Rwanda. The trip absolutely messed up my theology and changed my life. As I prepared for the trip by reading and studying the nation’s history, particularly around the genocide that occurred in 1994, the lenses that I wore no longer fit quite right. In my mind, I thought that if people were saved, they wouldn’t face any problems and that they would get along marvelously with others (what Bible was I reading and what world was I living in?). But in Rwanda, there were two main ethnicities – the Hutu and Tutsi – who are a largely churched people, Catholics and Protestants who espoused deep faith in Jesus. However, their orthodoxy didn’t quite translate into right praxis so that there were priests, pastors and other religious leaders and believing congregants willingly and complicity murdering their neighbors, families, and friends. This reality challenged my thinking so I had to readjust my thinking to fit reality. I came back to the states and immediately began to study the intersectionality of faith and justice. And I made a mess of myself because all too often hubris and inexperience got in the way. I thought that this epiphany I had would automatically launch me into a place of knowing, having all of the answers to questions that most of the people around me were not asking. I kept chanting, reconciliation, and didn’t fully understanding what reconciliation was or what it would look like when it was accomplished. Even so, even in my naivety God was faithful. God delights in starting where we are to get us to the place He needs us to be. He is not looking for perfection, just availability. As I studied and read and studied some more, I also wanted to get practical. At the time, I was working for a bank and while I enjoyed it, I started to get really anxious about moving on. The problem is that I didn’t quite know what I should be moving on to. All I knew was that I wanted to work with people, so I applied for dozens of direct service jobs. I didn’t get any of them (and this is before the economy tanked so we can’t blame it on that). In hindsight, I thank God that none of those jobs materialized. Failing in this way, if you call it failure, opened up an internship working with youth at a Christian organization for the summer which was a good experience for the most part. It gave me the opportunity to formalize some of the thinking that I had done on faith and justice issues, particularly around race. But more than this, it opened my eyes to some of the challenges that the church in America faces when it comes to dealing with manners of justice. For the churches that involve themselves in outreach or justice ministry (which are few and far between) many of them are doing relief work. Painting and repairing houses. Handing out food. Giving out clothes and other toiletries. All of these activities are good and temporarily relieve the short term pain of people. But all too often they fail to address the systems that perpetuate the pain. After my internship and a few more arduous months at the bank, I landed a part time job as an administrative assistant for a nonprofit that was doing advocacy work on hunger and poverty. Although I loathed my job, I loved the organization which really addressed the faith and justice tension in its advocacy work. Not only so, but they were seeking to change the systems that caused hunger by trying to pass legislation that expanded and strengthened existing hunger problems both nationally and abroad. While I appreciated everything that I was learning as a result of being a part of this organization, I still felt that those who were poor, disenfranchised, marginalized, had a role to play in their own suffering. I kept thinking that as much as we needed better legislation that provided safety nets for those who were without, that the poor were still individually responsible for their own problems. That they just needed to work a little harder. That they just needed to stop doing X and start doing Y, which would of course put them on a path to financial freedom. But I thank God that He didn’t allow me to persist in this line of thinking. As I continued down the nonprofit path, specifically working in organizations that did justice work with a racial and class analysis, I really began to understand the systems that were at play that restricted people’s freedom, making their choices for them while still holding them responsible for the outcome. I began to see people who struggled to find employment were often discriminated against because of their skin color, regardless of their experience and education. I began to see people who could afford to own a home being sold mortgages with ridiculous interest rates that their white neighbors were not being sold. I saw how black men (and a growing rate of black women), were targeted and sentenced for drug crimes that they did not commit which limited their ability to find aforementioned housing and employment. And I saw how food could be used as a weapon of war, and how something as basic as health care is not easily accessible to everybody, and how the educational system is failing our children of color, and how the opportunities that are readily available for whites are often missing for people of color. As I began to recognize these systems, I subsequently began to understand that this idea of individual responsibility is one big, hairy myth because you cannot hold individuals responsible for decisions that they don’t get to make! You cannot say to an ex-felon go get a job and then reprimand him for not finding one because you refuse to hire him. You cannot shame him when you lock him back up when he fails to find housing when you won’t allow him to look for it. You cannot tell people that they have an obesity problem when they have no access to fresh fruits and vegetables and the only thing close to them is McDonald’s and Super America. You cannot take away a mother’s children for failing to put a roof over their heads and clothes on their backs and food in their mouth’s when you won’t pay her a livable wage. You cannot tell children to stay in school and get an education when you keep closing schools and defunding the ones that are still in operation. It’s been almost seven years since I started to passionately pursue justice and reconciliation. I have learned a lot and I still have so much more to learn. So much more! Yet, gone are the days when I didn’t care about the poor, the suffering, and the marginalized. Those days have been replaced with periods of weeping, agonizing, advocating, studying, giving, sowing, working, learning, and praying so that I can be an instrument in God’s hand to right the wrongs in our midst. I tell this story because I don’t want to walk this journey alone; I need my brothers and sisters in Christ to walk with me! There are SO MANY Christians – well-intentioned, loving, and compassionate no doubt – who are where I once was but God is calling us all out and up to do our part. 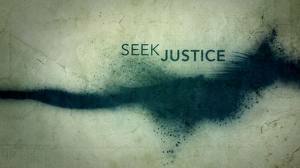 It will take ALL OF US to get to begin to stand for justice because evil is just that pervasive. But armed in the power and Spirit of the living God, we can move this mountain of injustice together.